Shortest boy among the Windsor conspirators. His curly hair is strawberry-blond (think Nancy Drew), and he has warm brown eyes. He looks, as Kurt says, “an older, awkward version of a cherub”, because of his classical features, and his body which looks caught in the middle of being a child and an young man. 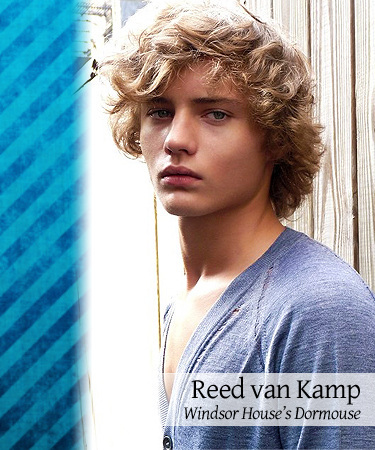 Reed Van Kamp is a Warbler and Windsor House resident. He is rather klutzy and his fellow Windsors seem to know better than to give him sharp, pointy objects. He sleeps in a padded dorm because of this.His mother is the famous fashionista, Hilde Van Kamp, and he instantly bonds with Kurt Hummel over fashion, even volunteering his own couture clothes for Kurt to wear as he wishes. He's also a painter and fashion designer, but the last one is not necessarily by choice, as his mother is grooming him to take over her fashion empire. Reed just wants to paint and sing. After meeting Shane Anderson, brother of Blaine, he becomes romantically attracted to him, though still unsure of his orientation. Reed plays peacemaker in the group often, trying (and failing) to achieve any real result unlike Blaine does, but he can become rather passionate on stressful situations. This is proven in the episode Boundaries when it is he among the others who break Logan and Blaine apart during their fervent confrontation. Unlike the others, Reed has also yet to speak ill of Logan, and possibly sees him as someone who still has potential to change and is simply misunderstood. The fact that his friends see otherwise does not bother him. He's very giving and kind, and doesn't believe in himself enough, mostly due to his mother seeing any hobby other than fashion design as a waste of his time. Kurt is more than happy to show him otherwise. As of Jumping Hurdles, Reed had officially started to room with Kurt (his side of the room is still padded over), who he shares a very close bond with owing to their similar interests and the way Kurt's more self-possessed demeanor becomes a foothold for Reed to rely upon in his confusion. It is to Kurt that Reed confesses the most, from his confusion in his sexual preference, to his distress over Shane and the emotions towards him. Unlike Shane, at first sight Reed had not seen the younger brother as anything more than precisely that, and a possible new friend. Though it's obvious that Shane's immense energy, open gawking, and intense admiration baffles and confuses him, Reed tolerates him. This is possibly out of real interest in finding his polar opposite and the fact that he claims no one has ever fallen in love with him. During the New York trilogy, his relationship with Shane develops, especially after Shane surprises him by anticipating his falls and showing genuine care and protection for him especially when the lights go out in the party. Even at the goodbye, he shows signs of reluctance to let go, and bursts into tears when he leaves. 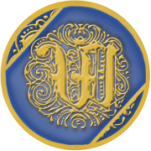 The Paint episode shows further development as a very crushed Reed is clearly the one of the most affected Windsors following news of Shane's accident, becoming nearly hysterical. He confesses to Kurt that while he still does not know his preference, he knows for sure that he likes Shane. His worst injury was when he rode a bike downhill, crashed into a parked SUV and had to stay in hospital for two weeks. He doesn’t know himself very well yet and it continues to bother him. He feels that he should figure things out with himself and it would help him figure out what to do with Shane over there. But he is willing to put up with Shane’s ceaseless adoration, because he likes him and makes him happy. Recent developments on his side of the fence show that while he doesn’t completely understand himself or his orientation, he has developed romantic feelings for Shane. He's the smallest boy in Windsor and with that and his clumbsiness, he's a little self concious. But he's hugged around and well-accepted so it doesn't bother him anymore. If he liked a girl, hed go on a picnic with her. He likes to sing all kinds of songs as he likes music in general. He's not as comfortable singing solo than he is with a duet or a group because he doesn't like everyones eyes on him. One day, he wants to sing in a real band. He’s got incredible hair care products, but mostly shampoos, conditioners, treatments—he’s got these really downy, shiny, bright curls. Like in a shampoo commercial. He doesn't mind being short because he knows he'll grow one day and he likes that everyone helps him reach things in high places. What he wants to do when he's older: "I think…I’d be going with what mom decides… probably go on to design—I’m already halfway there…my line will first launch at Spring/Summer… Paint some more, maybe buy a nice house with a big view… *blushes* maybe share the house with someone special if I’m lucky enough to have one…"
Reed hasn't tried, but he'd be a really bad driver. Reed is very ticklish and the other boys use that against him, though not all the time as he generally falls and hurts himself. Reed has had a lot of concussions. Reed hasn't really thought of a first kiss situation. He just hopes it'll be with someone he felt safe with and who he trusted. He knows he'll get his kiss when the time feels right. Reed once fell asleep outside and a sparrow was also asleep in his hair. He says the saddest thing about leaving New York was leaving his few friends behind. On if he enjoy modelling: "No… (turns red) Not so much… It’s always awkward to have all that attention on me during a shoot." His bed hair is really fluffy in the mornings. He hid under a comforter during paranormal activity 1 and 2. Reed stabbed himself six times while learning to crochet and gave up, but he managed to make part of a scarf. He can cross stitch although he'd prick himself a lot doing so. He went into one of the bathrooms to get some cleaning supplies left there, tripped and the shower curtain collapsed on him and then ran out screaming. All the padding in his room prevented him from having a room-mate. He had an incident with a cuckoo clock, an another incident in the cafeteria with a diorama. Reed hit himself in the nether regions with a cricket bat once. His floor is carpeted white. When given playdoh, he sculpted a rose that looks unsettlingly real. Ever since people found out Reed could sing solo, they encouraged it by singing along when at one time he had his headphones on and was singing to "It Takes Two" from Hairspray (Reed also cried). Reed doesn’t like it when people look over his shoulder while he paints. He is physically unable to go into an art supplies store/section without leaving with some kind/color of paint. No-one besides the Tweedles had ever asked him out. He likes working with acrylics and doesn't use oils much. He also uses charcoal, pastels and watercolors. Reed doesn't want to Cheerlead again. Reed can eat a whole pizza by himself if he's stressing over his art. Reed says it's fun painting when it gets messy even though it drives Kurt insane. He was at the height of his confusion (on sexuality) when he started at Dalton and all the people helped him, and he said he wouldn't have managed without them. He said he didnt feel the pressure to label himself and he could be who he was. Reed has tried playing the violin before but he got too injured so he stopped. He can sew as he designs clothes, but he gets hurt a lot. Reed's only grown one and a half inches in the past while. His favorite drink is grape juice. When Reed once gelled his hair, it looked natural. Reed can't swim, he chokes. When all the boys played Ice Hockey, Reed was injured in the first five minutes and had to sit out. Reed had a terrible day and in his bad mood spattered six tubes of paint onto canvas. It sold for five thousand dollars. And no, he didn't understand either. Reed's not as rich as the Twins’ in a sense, but it’s just that he’s so heavily well connected in things relating to a lavish, fashionable lifestyle because of his mother—who is pretty much thrown lots of things because she’s like a goddess of consumer goodies, dictating trends, what to wear, what to eat and where to go and all that. Reed spent a while painting music. He said he listens to a song a lot of times, and then when he's ready, he listens to it again and paints what he hears. Reed is like a mouse - give him something awesome once and he's going to want a lot after. Spring is his favorite season but he likes the winter/fall fashions. He's five foot six inches but he wants to be as tall as Kurt. If Coco is being playful, Reed may throw designer clothes so she chases them. As long as they are out of season, of course. Julian had a photoshoot for a clothing line, and Reed asked him if it was for his. Julian said he nearly didn't go because the designer (Reed) hadn't bothered to come, but Reed stated he'd been dragged along by the Twins to another thing, so he couldn't. Reed sniffled when Lonesome George died. The worst cast scenario if Reed lived the life his mom set out for him; He would do everything his mother expected, and then the pressure would be so great that he’d crack under it. He’d basically just lose himself—it would be all about what everyone then expected out of him as the “fashion prince” or whatever it is. He would stop singing, he would stop painting, he would go into a downward spiral in the pressure of the fashion industry, end up with some bad vices…and die at a young age. He likes that he can paint and sing as its a way to express himself. Because he has a whole lot of clothes as well as unlimitied dry cleaning, he just wears his normal clothes under a smock when he paints. On another serious accident he's had: "I was trying to get some stuff down from my closet and I fell off a stepladder. I concussed myself and needed to have an arm cast." Reed will avoid horror movies if he could. But he’ll still end up watching if everyone else is watching. When someone asks what a loud noise was, he responds with "I fell into something?" His favorite Harry Potter book is the Goblet of Fire. Reed has had Coco since she was a puppy, born from her mommy Donatella. :) Donatella isn’t around anymore, but Reed really does love Coco a whole lot and looks forward to seeing her when he comes home (in spite of the fact that she usually takes him off guard and tackles him to the floor). Reed and Dwight are said to have the lowest self-esteem in Dalton. He wouldn't mind dressing up in a Gaga costume. When he eats cake, Reed eats the strawberries last. His hair won’t ever get cut short by accident—the stylists he goes to are all too afraid of him and his mother. They wouldn’t dare ruin Reed van Kamp (do they want to be very fashionably destroyed by his mom if he should come to her with his hair cut too short…?). Fears: Anything that can maim or hurt him. The dentist. Reed didn't have many friends prior to Dalton. He was very quiet, cautious and avoided. He is a weepy and needy drunk. Once hadn’t slept for a couple of days rushing on some projects. He was really out of it when he came down to breakfast with a still wet pottery assignment. He was so vacant that he’d nearly started eating clay if the Tweedles didn’t stop him. He's very good at reading text talk. If Reed was kissed unexpectantly, he would cry and get a bit shaken up but the whole of Windsor would help him. If he was in a store and there was a power cut, he would panic. He wouldn't make it out okay unless the power came back on or he had someone with him. His favorite possession is his sketchbook. Reed owns a number of humongous oversized scarves. He is prohibited from walking his own dog down Central Park. He trips at least three times a day…on nothing but his own feet. Reed went through a 'red' phase. His New York maids are Marcel and Laney. All boys and some girls had a jousting competition. Everyone rode a horse, and used an eleven-foot log to try and knock off their opponents. Kurt and Reed were helping everyone get styled up for it. Reed wasn't jousting as it'd be unsafe for him, and Kurt wasn't jousting either. The houses Windsor, Stuart, Hanover and Lancaster have agreed that whichever house "wins" will be served by all the other houses in a big cookout. Kurt was wearing immaculate royal robes. Reed is going to be a guest designer for 'America's Next Top Model' and was freaking out to Kurt. He wanted Kurt to help him come up with a challenge for the models. They came up with the challenge of taking a fashion photo amidst the drama of Kurt's cookies. The models will have to model Reed's designs. All the boys were asking to come because they want to see the models. Reed's intro would probably be, "This week, you're going to be modeling for someone who's already reached quite a bit of fame in the fashion world even for his age--he's had shows in NYFW and his mother is famous fashion magazine editor Hilde Van Kamp. Please welcome, Reed van Kamp~!" And Reed would just...sort of wave... "Hi..." And Kurt would be throwing things at the screen. "Talk louder!" But at least, Reed isn't going to be a pushover. He has definite ideas on what he wants as a look for his fashion line. And he's fairly critical of the girls (and guys) who'll model for them. Reed is very quiet at home—mainly because his home has some serious air pressure due to his mother’s powerful presence. It may be why Hilde and Winston broke up; she’s a very controlling, driven and headstrong woman. Every time Reed is there, her presence alone is every reminder of everything she wants and expects Reed to become, she’s made that clear. Reed could’ve very easily been terribly spoiled, but the thing is, he’s just more lonely at home than spoiled—because Hilde was away often as well with all the overseas trips. She showers him with clothes and toys and product and he appreciates them, but it’s strange to want to see your mother and at the same time be positively terrified whenever she’s around. This is why he began to paint—to put color amidst all the white furniture—and why he began to sing—to fill the silence with sound. When he was small, Reed was left a lot at home. So the nanny would turn the CD player on to keep him company while she cleaned the house. One day, she forgot to turn the player on while she was cleaning, she heard someone with a small voice singing a song from one of the CDs she usually played. :) It was Reed, colouring on a sheet of paper, singing to himself. He didn’t actually learn. It was just something he did to fill the air with sound. Reed's most embarrassing childhood memory was that he once threw up on Carl Lagerfield's pants and shoes in New York during fashion week in the middle of a fashion show. On his relationship with his step-mother: She’s really nice to him on the few occasions he gets to come and see Winston. You know she actually feels a little bad—she can see that Reed tries really hard to see his father now and again, it’s just that Winston has little time. Of course he wants to see Reed too, but he’s always out and busy. She was actually agreed with Clark when he said that he wanted to give Reed some support by showing up in Parents’ Night. When asked about singing Twinkle Twinkle Little Bat, "My mom tells me what when I was really little, this is the only version I would sing. It took me a while before I learned how to sing Twinkle, Twinkle Little Star the right way. Before that, guests at the house would wonder what in the world I was singing." When he was little, he played with lots of colouring books and crayons. He also had a nice Fabergé carousel and a lot of stuffed animals. When Reed was a baby, he loved everything colorful. He’d stare with big brown eyes at anything very colorful, his gaze following it. He’d walked in shows when he was little, children’s wear, and presently he’s done a few casual-wear shoots for the magazine (mostly teen stuff). Got scared at all the attention he got when he was younger. When he was a baby, Reed loved colorful things. He was crazy about them. Hilde wanted his room blue, but it was wildly multicolored when Reed had his way. He only played with the colorful toys, the ones with bells--anything that was bright. He painted a lot when he was small. Fingerpainting and all that. For National Brothers Week 2012, Clark went to see Reed. One of Reed's most popular baby pics is the one with him with a pair of very curly pigtails. With ribbons. If Clark ever saw Reeds Cheerios performance: He would laugh and think it was pretty cool. Reed likes the idea of having a strong older brother, like the way Shane relies on Blaine. Haven really wants to meet Reed, and they bug Clark about it. When the boys decided to dress up in drag to be Kurt's mothers on Mothers Day, Reed dressed up in an Dolce and Gabbana flowy dress. They were plotting this for days. His fall count was six while wearing the heels. He once covered Marcus in 22 comforters while he slept, causing Marcus to change to Stuart house. Windsor once had a party, Reed had a little alcohol (the first and only time since), and he got drunk. He apparently has zero coordination skills and worries about being forever alone and Charlie had to sit him down on the floor and surround him with pillows so he wouldn’t hurt himself. Reed's worst class is PE because he has bad co-ordination. People in Reed's art class liked him. He went to a school in New York. He’s a frequent visitor of the clinic in school, and there have been one or two times he had to be rushed to the big hospital in Westerville. The Tweedles once filled his room up with cloth and he felt lost for a while. Regarding Rockband, the mop and Markie (Tamerlanes duck): David had to clean the mop and Wes had to repair the guitar. The Tweedles were positive it wasn't going to hit the chandelier. Charlie was close to calling animal protection. Reed says that the good thing was that they beat their Rockband record. Then the drums caught fire. In desperate need to cheer Reed up one time, the boys sand "If You Were Gay" to him. It flustered him but he was laughing by the end. Reed has a very large fluffy white Alexander McQueen coat. He was huddled in it, sitting, looking like a giant white fluffball with a curly strawberry puff on top. Windsor just stared at him. Wes: "......okay why is he that cute." David: "Who the hell got him that coat...?" Blaine: "I'm guessing his mother." Reed was just happily curled up under the coat--no hands or feet, just all white fluff. Shane fainted. On pet day 2012, Reed brought along Coco who was dragging him along as she ran full speed. When all the boys got together to read scary stories to each other; Reed is in a horrid state of distress and clinging onto Shane who is clinging onto Blaine with one hand. Reed about Logan: "I think Logan is a…really strange person. I mean…knowing what we do about him now…I think he just really needs someone to help him off the edge, you know? I’m not saying he’s a saint… And he wouldn’t like me to say so but I feel sorry for him. I don’t like being angry myself, and he just seems to have that all the time"
He thinks that Dwight would be a great older brother to him even though Dwight's younger. The Tweedles once hit on Reed because he was so small and adorable. They had to bribe him with professional acrylic paints to get him talking to them after being avoided for two weeks. In one of Reed’s exhibits, he got a large white room, armed fifteen Windsors with paint balloons, and walked away. If Reed were sexiled (kicked out of the room while Kurt and Blaine got it on), the Twins or Dwight would take him in and look after him. Dwight's done it before. The more awkward thing is if Shane officially comes to Dalton and it's Kurt who gets sexiled (far fetched as the idea may seem), and he and Blaine would have to awkwardly discuss how awkward it is that Blaine's brother and Kurt's bestie are going at it. When Reed asked what they were doing for David's bachelor party, Kurt crossed his arms and insisted that they were not going to jail. Tweedles then said "..........that....depends." Reed had to draw a duckling for art class, but the duck wasn't getting any sleep so someone had to step in and tell Reed to let the poor thing get some rest. The twins showed Shane a color chart of all the color names (ie. plum, fuschia, red, magenta, etc) and Reed yelled at them for teasing him since he doesn't know the different color shades. The chastising thing goes hand in hand with the fact that Adam WANTED Kurt and Reed to watch because he wanted them to realize how wrong THEY were. That he didn't want to have to hurt anybody else, but it was their fault and he was the one defending here, not them. He sees them as his assailants, instead of the other way around. Reed had to guest at Project Runway and didn't want to go and Kurt had to drag him and ended up going with him. When Reed crashed into his room, faceplaned and yelled, "YOU'RE COMING WITH ME TO NY FASHION WEEK WHETHER YOU LIKE IT OR NOT AND THAT'S FINAL!!" he found that Kurt was already trying an outfit on and had replied, "I was thinking of wearing this to day 1 of, what do you think? Should I save it for the second day? Don't want to peak too soon." The boys were looking through old photos and were seriously arguing who looked the best in drag. "Look at your knees! You look like you've been kneeling in ashes!" "Screw you, man, my figure was better than yours!" "You don't even look good as a blonde! It takes charisma to pull that off!" " Your heels sucked!" "Excuse you, I looked like damn supermodel in those heels!" "You look like you needed some serious eyebrow threading." "At least I didn't have a five-o-clock shadow." "Hey, I was Claudia freaking Schiffer in that dress. What do you call that shapeless sackcloth you were wearing?" "That was PRADA!" "Man, that was a bad lipstick color on you." "That was the only thing I could get!" "I think you'd've looked better in coral, really brings out your eyes." "Really?" And Kurt, the aforementioned victim of all this drag-ness, is pretending this isn't happening. "Look at this. You're not even sitting like a girl. You're sitting like a red-light district bang tail." "I was the epitome of grace!!" "You need grace. Like prayers. Like before meals." They then organized a walk-off. Reed was happy to help while Kurt wasn't but the boys dragged them both off to dress them anyway. They all went to Dobry. 45 minutes later, they were all dressed up. Hope was standing on a big auditorium stage as the girls squeal in the audience. "WELCOME TO THE DALTON ACADEMY WALK OFF!!" David opens the show. In full getup and wig and makeup. And a long silver evening gown. Katherine was laughing and screaming simultaneously. Charlie, in heels, follows after Wes, looking like he's way too big for that cornflower blue dress he's got on. Hope was falling all over Sydney, giggling. And then Shane. Who's still in the wedding dress. Reed was laughing too hard to stand up as Shane struts down the runway, hamming it up. Kurt asked " ...why are you dating him again?" and Reed raises an eyebrow at him before gesturing to the runway. Blaine swirls into the runway and struts down it. Kurt: "......I retract my previous statement." Wes strolls in wearing a flowy, wavy dress and strutting along, and all the girls cheer because he's working it. Wes flashes everyone a pageant smile and blows kisses before strolling off. The twins wore matching dresses. They were wearing that Zuhair Murad dress Miley Cyrus wore to the oscars. Satoru wore a red kimono dress covered in roses. David wore a sparkling blue and gray ball gown. Wes and Han were the finalists. Wes for pure fabulousness. Han for a disturbingly convincing costume of full sweet pink frilly loli dress complete with giant curly wig and ribbons. Lucy was very proud of that. With matching coat. And gloves. And socks. And baby pink platform shoes. And a ribbon. It was disturblingly convincing. He looked like Lucy. He was wearing false eyelashes and sparkling eyeliner. Han had surprisingly nice legs in those socks. Lucy said he actually shaved them because she made him do it. Wes did get a crown when he won. He cried. And waved. The Dalton boys were laughing too hard to get up from their chairs. They were so proud of him. When Wes got changed back, he still wore his crown and pretended it wasn't there. For the longest time, Reed had problems organizing his closet by himself. When the boxes and boxes of stuff from his mom came in, he naturally had to sort them out--by designer, then by color. Considering how accident prone he is, that was not an easy feat to do, and he often gets helped - so to speak - by whoever Windsor was free at the time. In the time when Blaine wasn't around, Reed pretty much gave up on getting any proper help from the other boys. Wes and David couldn't tell designers apart, and Charlie couldn't even tell the difference between casual pants and formal pants, so there goes that idea. All the twins ever want to do was to play with the accessories and put on the clothes and reenact overdramatic scenes, so they weren't much help either. When Dwight was around, he just wanted to salt and purify everything. So when Reed became friends with Blaine, he at least had some decent help in sorting things out. But it wasn't until Kurt when Reed actually properly arranged his entire closet within a day of shipment arrival. The reason he went to Dalton was because it was his first act of rebellion. Hilde wanted to keep him in Manhattan but he told her explicitly that now that he was in high school, a lot more media attention will hit, being her son. He didn’t want to live that kind of life right now—he’d like to go to a quiet boarding school where he can focus. His mom thought that was sensible of him and agreed. It was Winston, his dad, that suggested Dalton Academy, having heard from some friends who used to go there that it would be a good idea. Why Hilde tried to send him to a boarding school outside the US: "I tried to tell her that…maybe I should explore things other than fashion design…or maybe just paint and sing or whatever. I think she nearly had heart failure. Said that if it was just all the influence of the crazy people at school and that if I got to some foreign school that had specialization in fashion, I’ll realize that my talent was really aimed to fashion design or something. Or fashion photography. (sighs) I just barely calmed her down that time." Hilde may have considered that Reed would look for a father figure, but she fully believes that her son could be taken to greatness without one. The scariest thing Hilde has done was threaten to send Reed to a boarding school outside of the US which he didn't like because he was halfway through his Dalton life and he has friends there, whereas if he moved he wouldn't know anyone. Hilde brought a property in Reed's name as a gift to him. Reed has very little stock in the way he looks because of her criticisms. She’s been doing that since he stopped being a “baby” and grew into that transition phase to puberty. Overall, Reed is convinced that there is very little he can do to reach his mother’s impossible expectations. That, I think, is the worst thing. Okay, if hypothetically Shane and Reed finally get it together and then Shane is an active hindrance to the sparkling career Hilde plans for Reed—she will most likely do everything in her power to remove him. (Think Blaine and Shane’s dad to Micah.) But she will do it less upfront, and be far more stealth about it. And no. Reed won’t get a say. He’ll want to get a say, and in all likelihood he might even fight—but based on Reed’s current emotional quotient (the future status is still vague), versus his mother it’s more likely he’ll end up being folded to her whims. Well, Hilde's always introducing trying to introduce him to young people of the same...standing. Reed always slips away because he can't handle socializing with them on a prolonged basis. Finally, Reed shook her off by saying that being with someone might take time away from career focus. Which she liked hearing and that's currently what's saving Reed from her attempts. But if she were to find out where Reed was so inclined and that he is open to the idea of...someone, it's CONTROL CITY. ...if she were to meet Shane and found out that this was going on, then Reed's whole cover will be blown and she'll take over. Shane would take anybody if it means keeping their grubby paws off Reed. The first thing he noticed about Shane was his smile. You know that bear that Shane stole from Reed when they first met? That bear is still in Reed’s room. Reed’s concern is that Shane is really energetic and sociable, while he is clumsy and retiring outside of the boys in the dormitory. It’s no secret that he has a lot of insecurities and he worries that Shane will become lose patience with him. Shane would be listening to his iPod while Reed paints, and when Reed gets tired, Shane would sit with him and they’d watch an old movie about dance and they’d fall asleep like that. Reed likes Shane because he feels safe around him. Like everything will be okay because he’s so sure it will be. He’s always sure. It makes him feel like everything he is right now is already sufficient. And he's never felt that way, ever. He wanted to tell Shane how he felt but then Micah came along. On starting to like Shane: "(looks around, makes sure he’s alone, then turns red, fidget and stares at his hands) …I think…I started to feel it during the party… He kept me safe and all…And …I didn’t mind if he held me like that a little. Which is strange because I usually am not fond of people I don’t know well touching me…"
If Shane wanted to confront his parents about his sexuality, Reed would help him out. He's thought about visiting Shane at his school but hasn't seen a reason or chance too. His favorite thing he ever painted was the painting he gave to Shane. Shane once busted into Reed’s room dancing to Ain’t No Stressin’ and Reed kind of just smiled and kept painting like nothing was happening. Shane tried to impress Reed by making a shirt. …it ended up having three armholes and one sleeve longer than the other. Reed tried very hard not to laugh. Failed. Erupted into fits of giggles. Shane kind of just tossed the shirt away and laughed. If Shane ever saw his Cheerios performance: Shane would ask for COPIES. To GAPE at. And print out screencaps. Once, Reed held Shane's hand and helped him paint. Reed actually likes it that Shane can't tell the minute nuances of color. He thinks it helps puts things to perspective. Shane likes the fact that Reed's pajama sleeves are too long. Thinks its cute. Shane was singing 'The Fear You Won't Fall" while playing guitar, and Reed was curled up beside him, singing along softly. The two of them shared a little kiss after the song, Reed looking pink-cheeked and very happy. Shane was just grinning like a lunatic. Shane brought Reed a very large teddy bear, which Reed then named 'Shane'. Reed blushed bright red at the idea of getting covered in paint for Shane, but Shane was happily taking notes. Reed protested that, "OMG we can do other things okay!" while flustered and trying to hide behind his canvas. Shane piped up with "For Spring Break, d'you think he and I could-" but Kurt and Blaine told him off right away. Shane can undo all of the damage that getting caught with Micah did to his once-then boyfriend. Micah would also get a family that loves and accepts him. But Shane loses all memory of Reed. What does he pick? Shane replied, "I hate this question like I hate spiders, the fact that I'm supposed to understand colors past ROYGBIV, and that LEONARDO DI CAPRIO HASN'T WON AN OSCAR YET. Look, I have enough problems with Reed trying to explain to me the difference between Salmon and Coral." When the two of them broke from the kiss, Shane had been very, very, very careful. He was staring at Reed and moving slowly—the kind of thing you’d do when you spot a small animal and you don’t want to scare it away. Reed seemed to realize what just transpired and he turned scarlet and got really flustered and then they both tried to say something at the same time. And then they stopped. And they tried again—and ended up talking over each other again, and then they stopped. Finally, Shane just took Reed’s hand and gave him a hopeful smile. Reed smiled back and squeezed his hand. On the anniversary of Alexander McQueen's death, Reed and Kurt watched every one of his fashion shows in mourning. The twins asked what was wrong, and when answered, they left them to it. He had a little crush on Kurt, and told him so. Kurt had a little crush back. Charlie says it's safer for Reed that he didn't have a roomate until Kurt agreed to 'babysit' him. He says it's awkward rooming with Kurt when he has Blaine around, because of the 'study sessions'/walking in on them making out. Reed says that the best part about having Kurt as a roomate is that he's one of the best people he knows. But the worst is that Kurt is so finicky. He and Kurt were in a magazine shoot for Hilde. Kurt has the most fashion sense, but Reed has the most clothes. Reed says Kurt employs the “beauty knows no pain” rule whereas he likes to be comfortable. Him and Kurt watch TV together, plan outfits for when they can go out, they sing together [to get Reed more confident] or when there’s a society event and Reed’s mom has an invite and can’t go, Reed makes Kurt his plus one—but mostly Kurt spends his time making sure Reed doesn’t maim or otherwise injure himself. They hardly ever shop together—Reed has enough clothes for the both of them. And their idea of shopping consists of Reed pulling out lookbooks from designers and runway shows and the two of them picking out what they want.